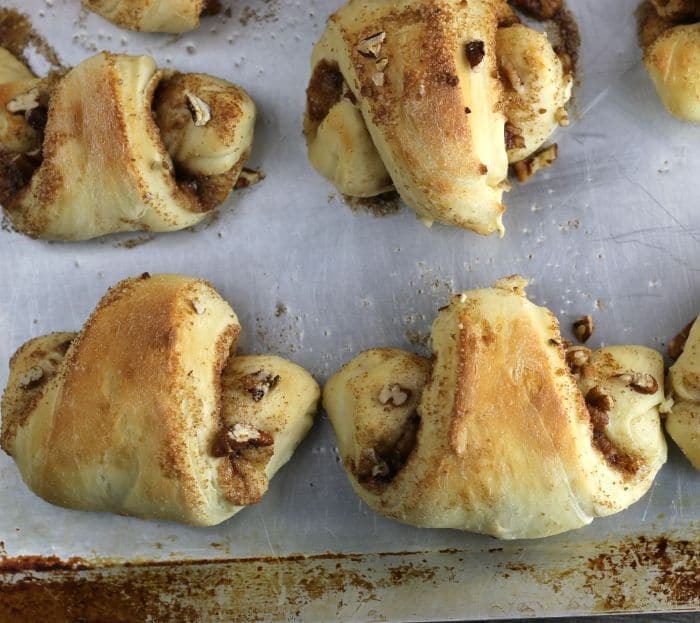 Pecan Cinnamon Yeast Roll-Ups, soft chewy sweet rolls that are loaded with cinnamon, sugar, and butter so delicious you won’t be able to stop at just one. 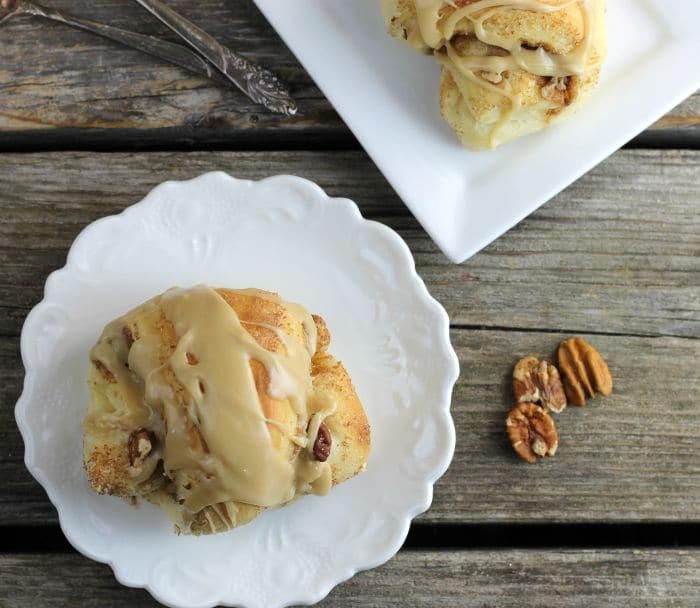 Pecan cinnamon yeast roll-ups a spin on your basic cinnamon rolls, but a bit more fun. When Easter rolls around I think of my mom’s poppy seed coffee cake that she would make when I was younger. The poppy seed was mixed with coconut and other ingredients and to this day is still my favorite. I have talked to her about the recipe, she says that she has it stored with her other recipes, but I keep forgetting to get the recipe from her. My mom no longer makes her delicious coffee cakes, but my sisters and I are carrying on the tradition of bread making. Over the Easter weekend, I stayed overnight at her house so that I could get up and help with fixing Easter dinner. 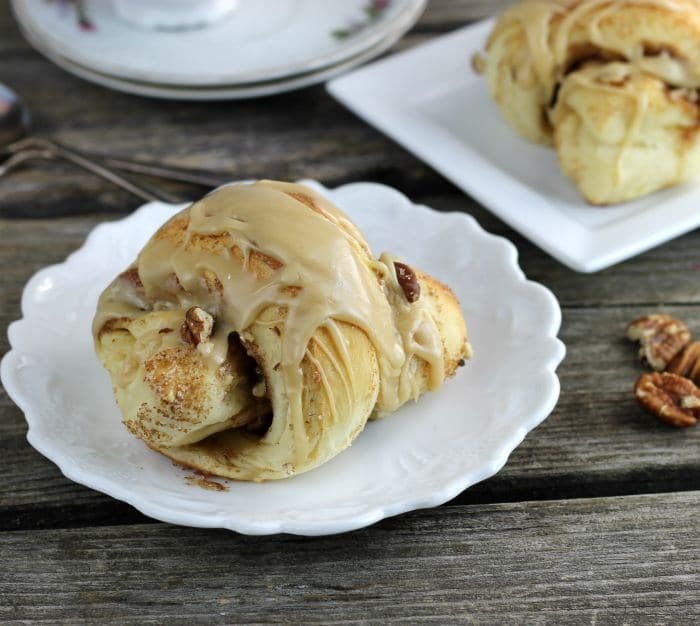 I wanted to make something special for our Easter breakfast and since I didn’t have the recipe for the poppy seed coffee cake I made these pecan cinnamon yeast roll-ups. These did not disappoint. What is the best way to store yeast? The best way to store yeast is in a cool dark place, such as your refrigerator. How long can you store yeast? Dry active yeast can be stored 4 to 6 months in the refrigerator or 6 months in the freezer. Stay in Touch with Facebook, Twitter, Instagram, and Pinterest. 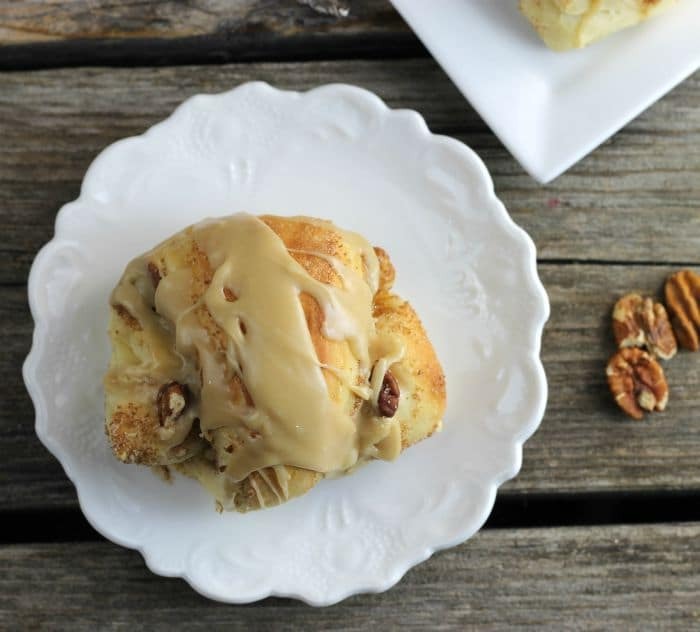 Pecan Cinnamon Yeast Roll-Ups, soft chewy sweet rolls that are loaded with cinnamon, sugar, and butter so delicious you won't be able to stop at just one. In a large mixing bowl combine 1 cup flour, yeast, sugar, and salt. In a microwave bowl/measuring cup combine the milk and butter. Heat until about 120 degrees F.
Add the milk mixture to the dry ingredients and mix until combined. Add the eggs and mix in with a wooden spoon. Gradually add the rest of the flour just until the dough slightly sticks to your fingers. Knead the dough for about 5 to 8 minutes. Grease the bottom of the bowl and turn the bread to coat both sides. Let the bread rise for an hour. Punch down and on a greased surface pat the dough out to form a 12-inch circle. Take the softened butter and spread over the dough. Combine the 1/2 cup sugar and 2 tablespoons of brown sugar and sprinkle over the butter. Sprinkle the pecans over top of the sugar. Using a pizza cutter or a sharp knife cut the circle into 12 triangles/pie shapes. Starting from the outside of the triangle roll the dough until the point. Making sure that the end/point is tucked under the roll place on a greased baking sheet. Continue with all of the rolls until they are all rolled up. Let the roll-ups rest for 20 minutes. Preheat the oven to 375 degrees F. Once the roll-ups have rested for 20 minutes place in the oven and bake for 10 to 12 minutes or until golden brown. Remove from the oven and cool completely on a cooling rack. While the roll-ups are cooling make the frosting. In a small saucepan place the 1/2 cup brown sugar, cream, and butter. Bring to a boil and cook for 1 to 2 minutes. Remove from heat and cool slightly. They are best if eaten the day they are made. They are one of my favourite yeast desserts. These look absolutely irresistible! Pecans rule and this recipe is a great use of them! Wish I had one with that great frosting now! I love the shape of these! I will be doing this with my next batch of cinnamon rolls!! !